Tap into your organization's ultimate competitive advantage - teamwork. 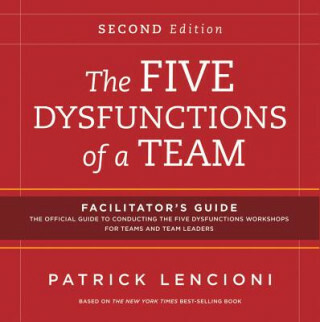 Based on his best-selling leadership fable, "The Five Dysfunctions of a Team", Patrick Lencioni gives trainers everything needed for a high-impact, half-day, full-day, or two-day learning experience for functional teams or team leaders. Significantly revised and improved to meet the changing needs of organizations and individuals, the second edition of the Facilitator's Guide includes two distinct workshops. The "Five Dysfunctions of a Team: A Workshop for Teams" helps team members improve in each of five key fundamentals: trust, conflict, commitment, accountability, and results. The "Five Dysfunctions of a Team: A Workshop for Team Leaders" provides leaders with an in-depth understanding of the model along with techniques for applying the theory to help their teams. Ideal for off-sites and retreats or even a series of development meetings, this training package will allow teams of all types to begin the journey towards greater productivity and cohesion. This Facilitator's Guide Package includes: binder (with loose-leaf pages and tabs), paper assessment, two Participant Workbooks, poster, a Frequently-Asked-Questions booklet, a flash drive containing scripts and PowerPoints for both workshops. "The Five Dysfunctions of a Team is simply the best content available on teams. After implementing the products extensively within our organization, we have found Lencioni's practical approach to be invaluable." (Mike Phelan, principal, Deloitte Consulting). "Lencioni's approach to team development is refreshing - practical, extremely engaging, and not touchy-feely. I would recommend this experience to any team wanting to excel." (Vern L. Toland, managing director, Hilton Grand Vacations Company). ""The Five Dysfunctions of a Team" program not only restored the fiscal health of our company, it provided the crucial tools forus to face the economic downturn. The program has enabled us to sustain performance through creativity and teamwork and we're using it throughout our entire company." (Matt Danilowicz, CEO, Clear-Com).